She followed me all the way to the end, eyes shining, “Wow, that is great! There is a BLOG POST right there!” she said energetically. Wow, usually Ben was the one telling me that, but if the librarian- who didn’t even know I had a blog- thought so, it must be true! So I set aside some time today to share this REALLY INTERESTING INFORMATION with you :D.
I regularly have to go through it to remove stuffed animals, fairy wands, play food (sometimes real food- blech), and make sure none of our “home books” are getting mixed up in there. My daughter doesn’t “commingle” the books, but there is evidence that my younger toddler isn’t 100% on board with this policy just yet. You can’t tell, but there are probably six quilts and blankets all folded up underneath the white blanket there, so it’s nice and comfy. 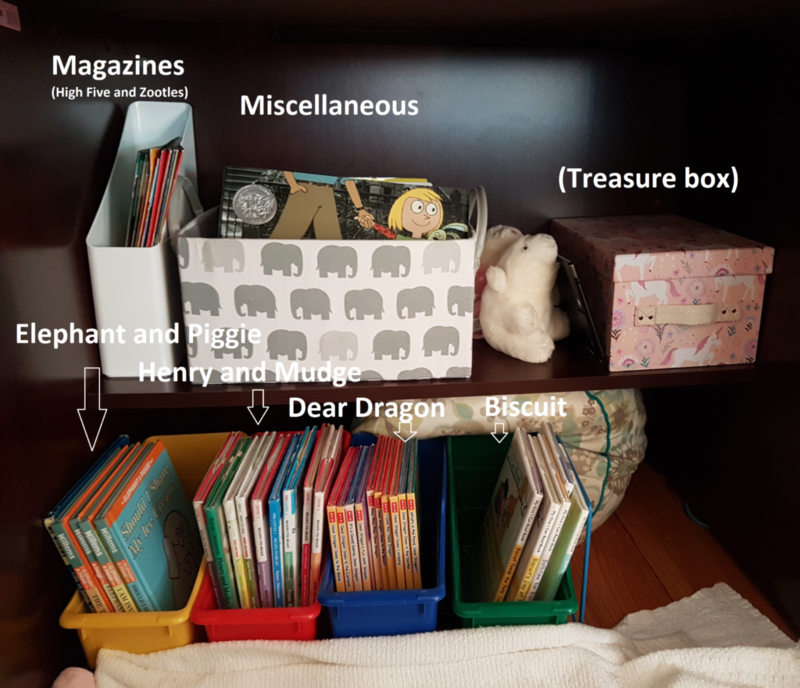 We tried different versions of the nest including a sleeping bag and multiple bean bags, but it always felt a little too scrunched up or lumpy, and books would always get buried and lost. This flat, open version has worked the best so far, and she frequently tries to turn it into a fort or tent-like space. The cushion back there is intentional. Before, the book bins would get pushed back under the shelf. While the spines were visible, it made it hard to take books out and slip them back into their bins. So books would somehow wiggle their way out, but never get put back in place! Now, the cushion keeps everything pushed out and keeps all the books very accessible. We have a system where she’ll take a book out from the right side to read, then return it into the left side of the bin when she’s done. This helps her keep track of which ones she’s already gone through. She gets pretty annoyed when her little brother goes through and mixes things up, but I have to insist that she let him into the space too- I definitely want to encourage a love of reading in both of our kids! “Well, you just had three weeks to read it, why didn’t you read it then?” I’d sigh. It would happen with almost all of the books on the shelf, except the ones we had taken out to read to her ourselves. I knew it wasn’t her fault, though- we just needed a system that made everything more accessible to her. So the I tried the book bins for each series and that has worked out really well so far. 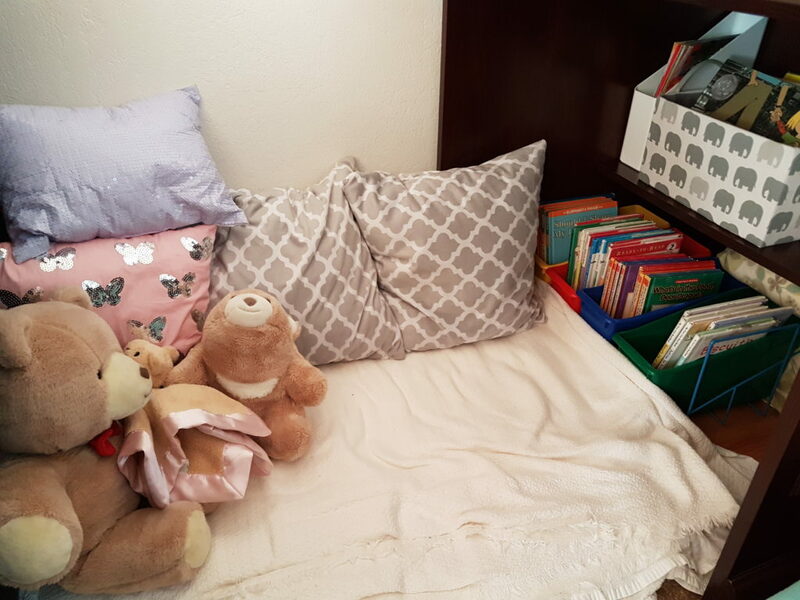 When I was setting up the kids’ rooms, I spent hours daydreaming about fluffy reading nooks and cozy hideaways. Before we settled on the nest as it is today, we had made a cute little teepee which was… cute, but pretty impractical as a reading space. I’ve scanned hundreds of images on Pinterest, but at least half of them are not earthquake safe (hello, California) and most of the rest fall in the cute-but-impractical (or uncomfortable) category. I never imagined that her favorite little space would end up under a dark mahogony side table thingy, but it has worked out really well and is cozy enough. Before yesterday, I had never met anybody in person who cared about organizing books as much as I apparently do! I didn’t even know I loved it until the sweet librarian asked me to talk about it (though now that I think about the hundreds of hours I put into my fourth grade classroom library back in the day, it seems obvious). So that’s what motivated me to settle down tonight and share all about organizing books with you all! Now, time to go read :). Lara, the bookworm, is a Russian history professor who get caught in the middle of a couple of conspiracies. 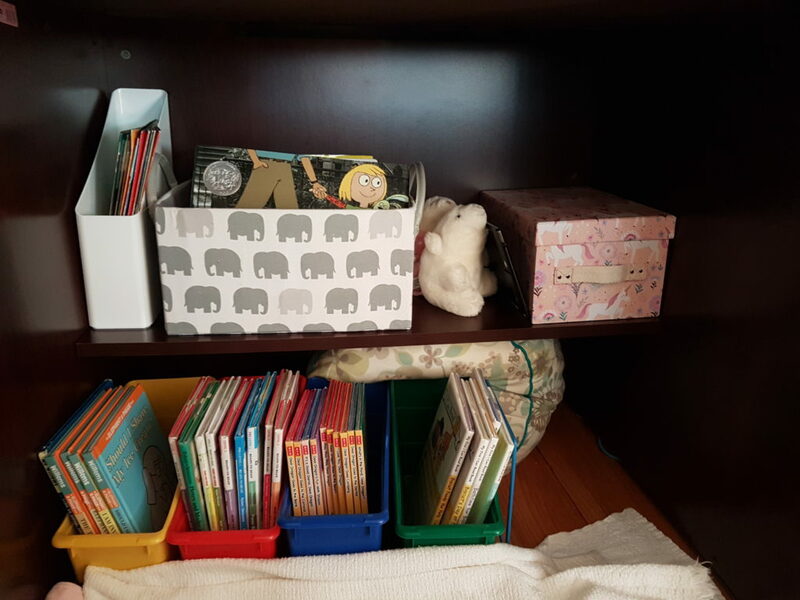 Love this idea…home books in the bedroom and library books in the nest!! I think grandma might also need a nest of her own! Yes!!! A nest is the best place to read <3. But what’s in the treasure box? !